Midfielder Serhat Tasdemir has signed his first professional contract with AFC Fylde. The 17-year old has penned a two-year deal with the Coasters with the option of a third year. Tasdemir burst on to the scene last season, netting a sensational hat-trick on his debut as a 16-year-old in the 6-2 Lancashire Cup victory over AFC Darwen. A product of the Blackburn Rovers academy, Tasdemir further enhanced his rapidly-growing reputation with his first league goal for Fylde in the 2-2 draw against Bromley last Saturday. 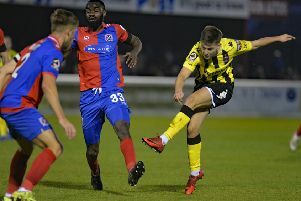 The teenager made his league bow on the final day of last season against Worcester City as the Coasters lifted the National League North title and was rewarded with a senior squad number for this campaign. Manager Dave Challinor said: “Serhat has a very bright future ahead of him. He is still only very young and he must take on board what we tell him, but if he does that and keeps working hard he has a great chance.